Octopus seems to be enjoying something of a boomlet in popularity at the moment. Until very recently I could mostly find fresh octopus only at specialty Spanish or Italian fishmongers, but these days it seems to be everywhere, even making an occasional appearance at the fish counter in my local supermarket. And just the other day I found imported Spanish pre-cooked octopus at a local discount “big box” store, a sure sign that this formerly “exotic” seafood has gone mainstream. The current popularity of octopus is well deserved. It has an intriguing, subtly maritime—but not at all fishy—taste and a slightly chewy, almost meat-like texture that many people enjoy, even those who might not normally be seafood lovers. 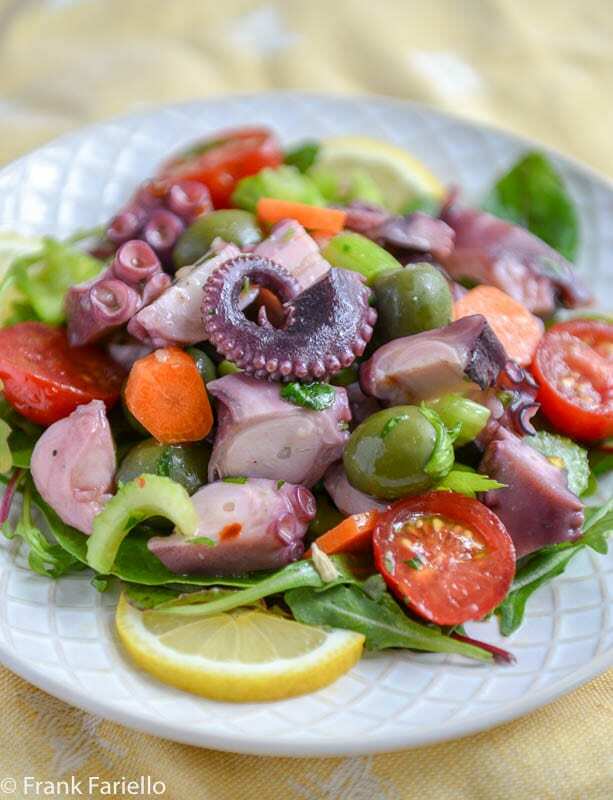 Personally, although I love octopus grilled or braised as well, I think perhaps the best way to enjoy its unique qualities is in insalata di polpo, or Octopus Salad. It’s delicious, colorful and extremely versatile. And, if you use pre-cooked octopus, you can toss it together in just a few minutes. If using pre-cooked octopus, rinse and drain it well and pat it dry with paper towels. Cut the tentacles into cubes and head, if included, into strips. If using fresh octopus, boil it until tender (see Notes for details), drain it and let it cool until just slightly warm beforehand. Whisk all the dressing ingredients together until well emulsified. Taste and adjust for acidity and seasoning. Pour the dressing over the octopus and mix well, together with any of the optional ingredients you may be using. Let everything rest for a good 30 minutes or more. Serve on a bed of arugula or tender lettuce leaves, with lemon slices or wedges on the side. The amount of lemon juice and seasonings that go into the dressing for your insalata di polpo are largely a matter of taste. I don’t like my dressing to be too acid, so I use fairly minimal lemon juice. But you can, of course, add as much as your taste dictates—and let diners add more if they like at table. (In fact, some recipes recommend that you only add lemon juice just before serving.) I prefer to be discrete with the garlic, too. On the other hand, I do like my dressing well salted and appreciate just a bit heat that comes from a generous pinch of red pepper flakes. But whatever you do, use best quality olive oil—it’ll make or break this salad as it does for any salad—and be generous with it. Not all recipes call for letting your Octopus Salad rest before serving, but I do find it enhances the flavor. As little as 30 minutes will help, while some recipes call for 2 hours or more. But don’t let it go for more than a day, or the salad will lose its freshness and the flavors, especially the garlic, may get too strong. The bed of arugula or tender lettuce leaves is, of course, totally optional but a nice touch. The lemon slices add color and helpful for those who might like to freshen their salad with a last minute squeeze of lemon juice. As you can see from the list of optional ingredients, you can dress up your Octopus Salad in many different ways. Boiled potatoes is, perhaps, the most popular complement to the octopus, in which case you can call your salad an insalata di polpo e patate. It’s a nice, economical way to “stretch” your salad. Olives are also quite popular, often green but in Liguria, not surprisingly, they use the local brownish taggiasche olives. I personally think the fresh taste and crisp texture of celery marries quite well with octopus. Sicilian recipes often add carrots, celery and green olives to their insalata di polpo, along with a handful of capers. Insalata di polpo all’eoliana is made with cherry tomatoes and the larger caper “berries”. As mentioned at the top of the post, these days you can buy your octopus, whole or just the prized tentacles, pre-cooked. It is a great convenience, and the quality can be actually quite good. Fresh or frozen octopus you’ll need to boil until tender in well salted water. Some people add a bay leaf to the water for flavor, some a bit of wine or lemon juice, some a garlic clove, some the “holy trinity” of onion, carrot and celery. Cooking times vary widely. A very large octopus can take a good 2 hours until it’s tender, although a typical one will take perhaps 45 minutes. Baby octopus cooks in as little as 20 minutes. But do take your time. Some people dislike octopus because it’s “rubbery”, and of course it can be if it’s undercooked. If using pre-cooked octopus, rinse and drain it well and pat it dry with paper towels. Cut the tentacles into cubes and head, if included, into strips. If using fresh octopus, boil it until tender (see Notes for details), drain it and let it cool until just slightly warm. Pour the dressing over the octopus and mix well, together with any of the optional ingredients you may be using. Let everything marinate for a good 30 minutes or more. Serve on a bed of arugula or tender lettuce leaves, with lemon wedges on the side. Our local WF has octopus which is flow in from Portugal, naturally it is previously frozen. The quality is actually quite good and cooking octopus is really not difficult once you get the hang of it. This type of salad is actually my favorite preparation; fresh and colorful – a meal in and of itself. I love octopus and this salad looks fabulous. Bookmarking! In Catalonia in Spain they serve it grilled with a romesco sauce, which is also delicious. Thanks for another great recipe, Frank, and your customary meticulous and useful instructions. Thanks so much, Linda. Hope you enjoy it! What a picturesque salad! Such beautiful colors and alluring textures and flavors. The first time I had octopus I was a kid and it was at a sushi bar. I still order at sushi bars, but my favorite preparation is more like your salad. I like it best combined with other complimentary flavors, and this mix sounds as delicious as it is pretty. Thanks, Valentina! I do agree, octopus salad is a winner. I must admit that octopus isn’t my favorite, Frank. But then I read your comment about octopus being rubbery if it’s not cooked properly. That must be the culprit then as the rubbery texture is what always got me. The thought of pre-cooked octopus is a little surprising, but I trust you that some can be quite tasty. This salad looks phenomenal, and I’ll even be willing to try out octopus again now. I’ve definitely learned a bunch from this post. Thanks for sharing your tasting notes, my friend! You’re welcome, David! I do hope you’ll give octopus another chance, it’s one of the most delicious things out of the sea, IMHO. Frank, we love Octopus, but its popularity here is dampened by the price and availability. We do however find it fresh in the spring and your Insalata di polpo would make a lovely spring lunch. When we were living in the US we often found fresh and cooked octopus in Asian markets but not here. Thanks for sharing one tasty looking salad. And thank you for your comment, Ron! Octopus used to be quite reasonable here but as it’s becoming more popular the price is going up, up, up… Ah well, still worth the occasional splurge! Sorry about my silence of late, we’ve been travelling (UK but mostly Spain). Just got back late yesterday afternoon. Of course, I had a lot of octopus in Spain. Braised, boiled, carpaccio, in salads too. It’s definitely one if my absolute favourites. Although I’ve never tried to cook it, your instructions (as always) takes the fear out of cooking it. The Italian octopus salad is really one of my favourite salads, particularly in the summer. Will definitely put this on our menu if the weather ever starts warming up! No worries, Eva. Trust you had a wonderful time in Spain! I would seriously enter these photos in a contest for the prettiest salad, ever! Honestly, at least FRAME one! LOVE them all! As for the dish, I would love this, but I’m such a vinegar fiend, I may just have to sub the lemon for vinegar in this! Would it be a crime?! Thanks for the kind words, Christina. 🙂 You know, this salad is so colorful it practically photographs itself. And as far as vinegar goes, if you like it, why not? No less an authority as Ada Boni used vinegar in her octopus salad! I say again: ‘God bless Australia’ 🙂 !! I mean I live a few kms from a couple of small country townlets still steeped in Anglo-Saxon ways . . . but octopus: can’t always get the big ones but there are huge piles of the small critters which go into such a tasty dish at every one of our pedestrian supermarkets . . . not having tasted the pre-cooked ’tis not fair to judge, but methinks I would take the time to cook my own . . .
You’re lucky to have plentiful baby octopus at your disposal. Enjoy! this is marvelous Frank! I love it with potatoes as it makes a satisfactory vegetarian meal and it reminds me of my childhood vacations at the Sicilian seaside. It’s a little bit of summer in the winter! This is one of Mark’s and my favorite salads! I made it once for us in Venice, but I need to work on the cooking of the octopus. It’s amazing how many old wives tales there are about how to cook the octopus… Aside from the bay leaf, or the holy Trinity, or beating it to a pulp with the rolling pin, I’ve also been told adding a couple of wine corks to the water helps tenderize the flesh. I’m willing to try it… Have you ever done that? Our neighborhood restaurant serves this simply with potatoes, olives, and celery… It’s so good, especially when he finishes the octopus on the grill. Wine corks? Never tried it, but hey, why not? I’m skeptical whether it would make a difference, but it couldn’t hurt. 😉 Potatoes, olives and celery sounds like a wonderful combination. I’m happy to see details on how to boil octopus, as when I tried it, it turned out a bit rubbery. I’ll definitely cook it. For me, Italian and Portuguese shops are nearby. I think Asian shops also sell octopus, at least frozen, as well as squid. I think you’re right, yes, Asian markets also carry it, sometimes live! I hsd no idea you could buy pre-cooked octopus! I agree octopus is best in a salad, although grilled is lovely, too. This looks excellent — thanks. And thanks for stopping by, John. It you have a Costco close by, look out for it, it’s really quite good. Great timing with your post. Just got back from a vacation on the Island of Madeira and ate octopus salad at every meal I loved it so much! Was the Spanish pre-cooked octopus you bought at the local discount “big box” store found in the freezer section? It wasn’t frozen, just pre-cooked a vacuum sealed. Ready to eat right out of the package, and very nice, too.